Wanna make some money using your iPhone? 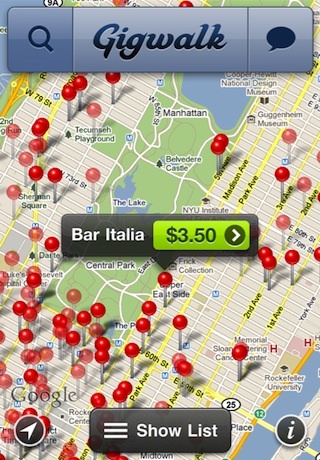 Gigwalk is a brand new app that lets you get paid using your iPhone to perform location based tasks for money. Businesses post gigs for gigwalkers who can then start working on them and get paid from Gigwalk. Gigs are to be completed at specific locations, at specific times of the day, and have a number of outlined tasks that need to be completed. Once complete you will earn the stated amount of money from Giglwalk via PayPal. Gigwalk is sort of like Foursquare but you get paid for checking in and doing some tasks. Gigwalk is a perfect app for food enthusiasts, restaurant goers, and active Yelp reviewers. Why not make a few bucks while you are enjoying that delicious seafood or buying a new computer? Gigwalk doesn’t support iPod touch users. 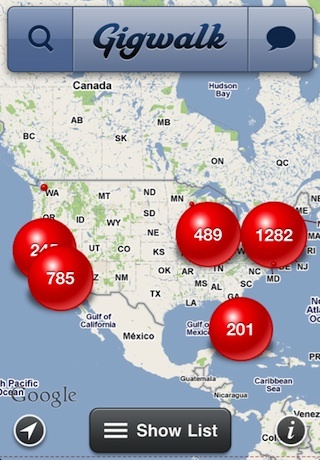 To use Gigwalk you need to have an iPhone 3, 3GS, or iPhone 4 and download the app. Some gigs specifically require an iPhone 4 because they want the higher quality photos. Once you download and run the Gigwalk app, you’ll be prompted to sign up for an account. You can use either your Facebook profile or enter your details manually. In the sign up process you are asked for specific personal information such as your date of birth, occupation, employer, and education level. Once inside, you should then go into your profile section by tapping the Gigwalk logo and entering additional skills you have and describing them in a sentence or two. You can also upload a profile photo. Go into the Settings tab and enter your PayPal email address so you can get paid for completed gigs. There are gigs for virtually any type of work you want to do from a variety of businesses. You can visit a restaurant, grocery store, electronics store, retailer, hotel, auto dealers, and more. There are even non-establishment type gigs like “Verify Residential Area”. 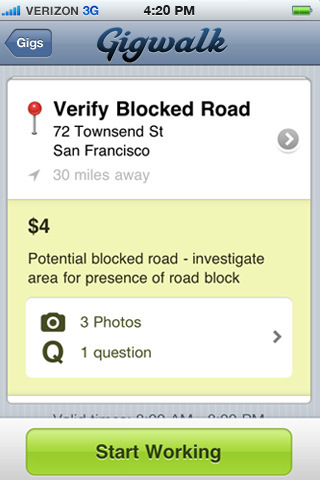 I even found a gig asking for a gigwalker to “Take pictures of red light cameras at intersection” of specific streets. Using the magnifiying glass icon, you will be shown the most local gigwalk gigs in your area. You can view gigs on either a map or by list format. The map is drag and pinch sensitive so you can see gigs all around the world if you like. Keep in mind that most gigs require you to actually visit a restaurant or other establishment, so you’ll probably be better off viewing gigs in your local vicinity. To start a gig you need to be physically within a set number of miles of the location of the gig. Gigwalk app uses the iPhone’s GPS to pinpoint your location, and if you’re not close enough to the gig you can’t start working on it. There are also valid times for a gig listed on the gig page. For example a gig might only be available M-F from 8:00 AM – 6:00 PM for tasks. Tasks for each gig are listed specifically with steps to be completed. For most restaurants, they want you to take pictures of the menu and label them accordingly as well as take pictures of the outside and inside showing the ambience. There are questions about the business like entering their hours of operation, the parking situation, whether they accept credit cards, offer delivery, have a website and more. There are also feedback type questions like how was the service or how was the ambience. Once you’ve finished a gig, you can submit it for approval. If you’ve done all the tasks it will be approved by the listing party and you’ll be paid. Gigs may be rejected if you have not met the specific requirements as deemed by the gig poster. Although you have to be with your iPhone at the location to complete the gig tasks, you can submit your results from anywhere. Some gigs shown on the map have a dimmed red pin instead of a regular red pin. These gigs are locked out to you, because you don’t have enough “Streetcred” yet. Gigs you work on are reviewed and if you enter high quality photos and text, you are given cred points. The better gigs are then locked out to new gigwalkers. As you earn more streetcred, they will become unlocked. Locked gigs state how many points they require and how many you have so far. How Much Money Can you Earn with Gigwalk? The listings we saw were listed at anywhere from $2.50 to $20 per gig. Completing gigs requires time and attention to detail. There are also Streetcred bonuses attached to some gigs. So the money isn’t much although if you are going to get seriously involved with Gigwalk on a daily basis and rack up Streetcred, you might do well enough. There is no limit to the number of gigs you can do per day in most cases, but yo can only do one at a time. It takes about 7 days to get paid from the time you submit a gig and it is approved. Also keep in mind that the money you actually get paid is reduced by PayPal fees. For example a $5 gig will actually earn you $4.55 after the PayPal fee. The Gigwalk service is new and spreading very quickly already. You’re going to find it in Los Angeles, NY, San Francisco, Philly, South Florida, Boston, and Chicago already. Gigwalk is great for businesses trying to get a mobile workforce to improve products and services at a low cost. It is also good for people who have a ton of free time and looking to make some money and have some fun doing it. Gigwalk is a glimpse at the future of location based services, and how the iPhone is changing the way we live. I mean how often is it that you find an iPhone app that actually pays you, instead of you paying for it? AppSafari review of Gigwalk was written by Joe Seifi on May 4th, 2011 and categorized under App Store, Finance, Free, Local, Productivity. Page viewed 7753 times, 3 so far today. Need help on using these apps? Please read the Help Page. Doesn’t work on my ipad3 and not everybody has an iPhone ! We’re being paid scraps. And have to use our gas and time just to get paid $5, IF….IF they accept your work! The gigs that pay more and require info from stores you will NOT get selected to do! FRAUD! Great app and the pay is for less than 10 minutes work and it works for all iDevices and android.